Will Cook played well for Borough at full-back. 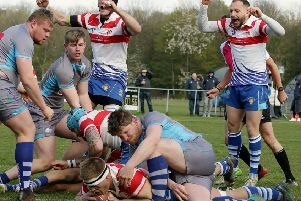 Peterborough Rugby staged a dramatic comeback at Rushden & Higham yesterday to secure two losing bonus points in their Midlands Division Two East clash. Borough trailled 29-8 with just 15 minutes to go, but raced in for three tries, two of which were converted, to keep themselves clear of the relegation zone, despite a 29-27 loss. It was a disappointing result though as Rushden & Higham have just two teams below them in the table. Borough started the match brightly and raced into the lead after eight minutes when centre John Anderson crashed over near the posts. Unfortunately Harry Roe had his conversion attempt charged down. Rushden’s huge pack then started to come into the game scoring two tries to give them a 10-5 lead, but Roe slotted a penalty leave the half-time score 10-8 to the home side. Borough, playing uphill in the second, then proceeded to allow Rushden to dominate the second half conceding three tries to leave the score 29-8 with 15 minutes to go and the writing appeared to be on the wall for the city side. However, rallied by skipper John Thompson, the Borough boys came back with three tries of their own through Stefan Gallucci (2) and Andy Barringer. Will Cook added two conversions, which left Borough in control of the latter stages of the game. However the brave comeback was halted by the final whistle denying Borough the chance to defeat the rapidly tiring Rushden side. Borough can take great credit from this comeback which will now surely see them in a good place for the remaining three games. Prop Stuart Day, along with the back row of Zak McClure, Kyle Bratt and Blake Heron, all showed well, while winger Gallucci and full-back Cook were the pick of the backs.